Vancouver, B.C. 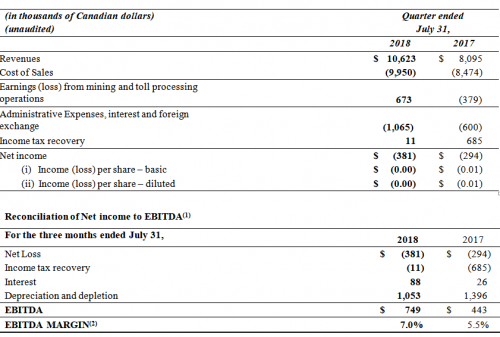 – Starcore International Mines Ltd. (TSX :SAM) (the “Company” or ”Starcore”) has filed the results for the first quarter ended July 31, 2018 for the Company and its mining operations in Queretaro, Mexico and toll processing operations in Matehuala, Mexico. 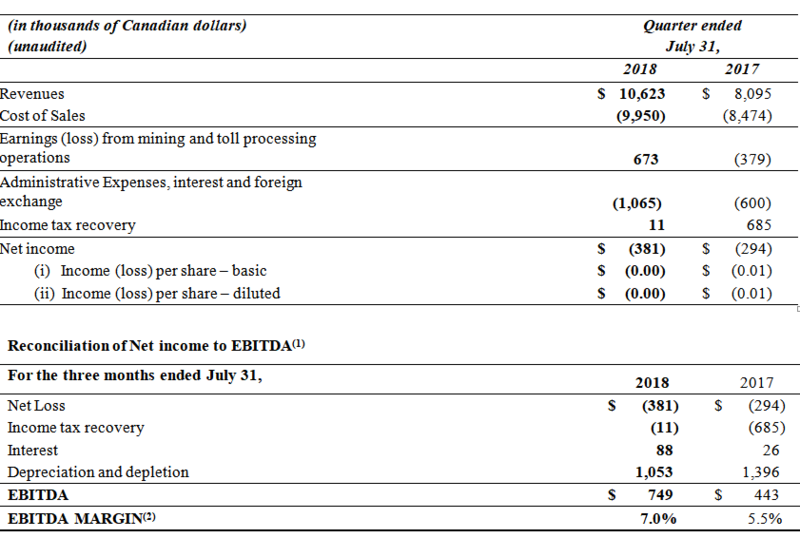 The full version of the Company’s Financial Statements and Management’s Discussion and Analysis can be viewed on the Company’s website at www.starcore.com, or SEDAR at www.sedar.com. All financial information is prepared in accordance with IFRS and all dollar amounts are expressed in thousands of Canadian dollars unless otherwise indicated. (1) EBITDA (“Earnings before Interest, Taxes, Depreciation and Amortization”) is a non-GAAP financial performance measure with no standard definition under IFRS. It is therefore possible that this measure could not be comparable with a similar measure of another Corporation. The Corporation uses this non-GAAP measure which can also be helpful to investors as it provides a result which can be compared with the Corporation’s market share price. (2) EBITDA MARGIN is a measurement of a company’s operating profitability calculated as EBITDA divided by total revenue. EBITDA MARGIN is a non-GAAP financial performance measure with no standard definition under IFRS. It is therefore possible that this measure could not be comparable with a similar measure of another Corporation. The Corporation uses this non-GAAP measure which can also be helpful to investors as it provides a result which can be compared with the Corporation’s market share price. Starcore International Mines is engaged in precious metals production with focus and experience in Mexico. This base of producing assets is complemented by exploration and development projects throughout North America. The company is a leader in Corporate Social Responsibility and advocates value driven decisions that will increase long term shareholder value. You can find more information on the investor friendly website here: www.starcore.com. for the adequacy or accuracy of this press release.